On a floating Rebel asteroid base, Luke and the others make contact with Chewbacca, who has returned with a mysterious talisman and is heading straight towards them. They make contact, but Han is hanging upside-down for some reason! Chewie flies past, and Leia figures there must be a reason for his odd behavior… so Luke decides to go after him, taking the two droids along. Luke follows the Falcon, flying a Y-Wing down to the surface of a moon in the Pana system. But they run into trouble when a large sea monster attacks the ship, and Luke ejects away. Suddenly they are saved by a mysterious stranger on another sea serpent, who runs the attacking sea monster off with his electronic fork. Luke thanks the stranger, who says his name is Boba Fett. Boba Fett offers to help them look for the Falcon. Luke decides to take him up on his offer, although Threepio is not sure it’s wise to trust him so quickly. When they reach the Falcon, Luke finds Chewie about to destroy the talisman in the Falcon’s disposal unit! Just as he does, something comes over Luke and he drops to the floor. The talisman was contaminated with a sleeping virus, and Luke is hung upside down alongside Han to keep him alive. Fett says he will go find the serum in the city. Chewbacca insists on going with Fett, despite Fett’s reluctance at the proposal. Chewbacca insists on going with him, and Boba Fett reluctantly agrees. 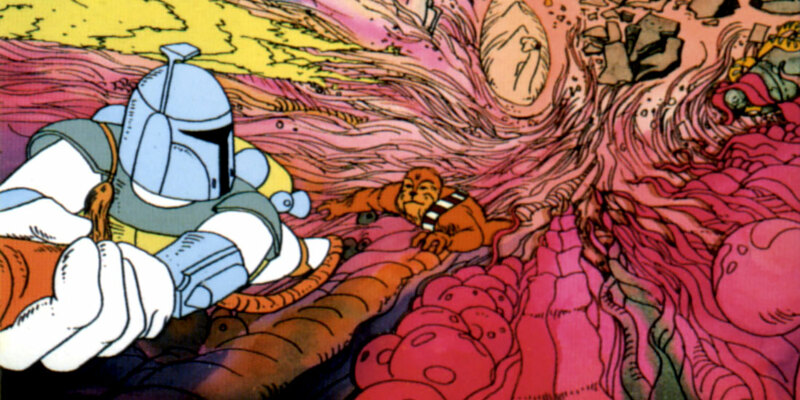 They set off on Fett’s serpent towards the floating city. Fett and Chewie make a difficult covert entry into the city.After they enter the city, avoiding Imperial troops, Fett tells Chewbacca to stay while he fetches the serum. Chewie is not happy about this, but relents. While away picking up the serum, Fett communicates with Darth Vader that all is going according to plan. Meanwhile, Artoo discovers Fett’s signal and intercepts his communication to Vader, discovering that all is not what it seems. While leaving the city, Fett and Chewbacca are ambushed by an Imperial skimmer, which fires on them. Fett fires back, but misses by a mile. Chewie then grabs the gun from Fett and fires dead-on, destroying the Imperial skimmer. Back at the Falcon, the serum is applied and Luke and Han wake up. Boba Fett is thanked again, but the droids reveal Fett’s treachery! Fett then makes good his escape by jet-pack, vowing they will meet again. As the heroes take off in the Falcon, Threepio notes that Chewie suspected all along Boba Fett was suspicious… he just didn’t smell right!